Lyndsey has been with MFT since June 2014, and was hired as our first dedicated stewardship staff member. That means she monitors all of the 150 (and counting!) conservation easements held by MFT, and is the point of contact for all landowners that own protected land. She also oversees the property management of the handful of farm properties that MFT owns until a buyer is found for those properties. Lyndsey grew up in Veazie, near Bangor. When her parents built their home there in the late ’70s, the area where the Bangor Mall now stands was still a dairy farm. 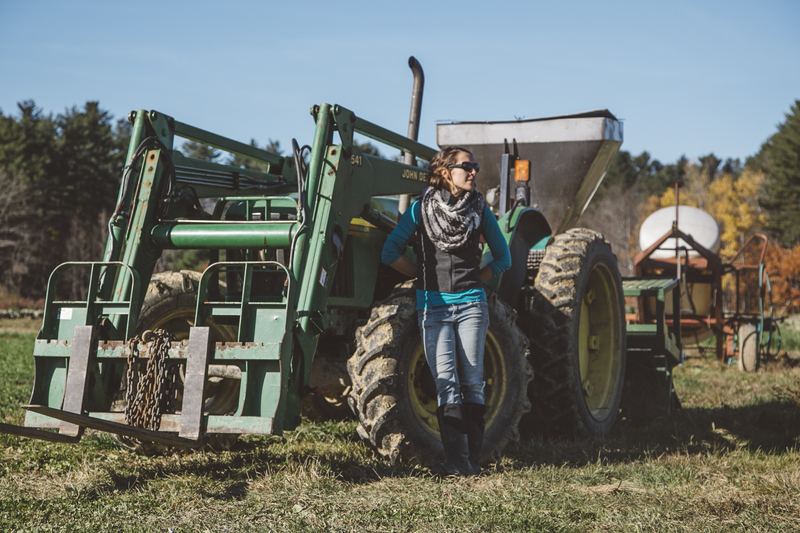 In her stewardship work with MFT, Lyndsey sees the direct benefits of farmland protection. She also gets to spend her workdays walking fields, forests, and trails, and working with the landowners and farmers who care for them. When she’s not visiting farms and wandering through the woods, Lyndsey splits her time between artwork, home renovations, and outdoor adventures. She creates her own artwork and sell originals, prints, and greeting cards at 3 Legged Dog Ink. She also runs the Bucksport Arts Festival, which she created in 2015 to provide a boost to area artists and showcase the incredible waterfront walkway in Bucksport. Last year, Lyndsey and her husband bought a 200-year-old farmhouse and have been slowly bringing it, and the surrounding land, back to life. Her favorite outdoor activities include running, hiking, kayaking, or just reading a good book in the sun. Q: What is the biggest challenge you face in your stewardship work? A: I currently monitor 150 conservation easements annually. That is a big number, and our protected lands are spread far and wide throughout the state. For each one of these easements, I work with at least one landowner as well as with spouses, children, grandchildren, farm managers, and employees. At the end of the day, that adds up to a lot of people. As our easements age, and as farms undergo transitions of ownership or farming operations, my biggest challenge is keeping up with so many landowners. MFT’s easements are designed to accommodate the ever-changing needs of a working farm. That means the landowners have a great deal of flexibility, but often translates to my needing to review requests, interpret what an easement will allow, and approve certain changes. I do my best to answer requests as quickly as possible so that my work isn’t holding up any aspects of the farming operation. That being said, sometimes a landowner wants to do something that his or her easement simply doesn’t allow. I see these landowners every year, get to know them personally, and want to see them succeed and meet their goals. It is not easy to deny a request, and adds to the challenge of maintaining positive, respectful relationships with so many people. Q: What are some upcoming goals and projects that you’re excited about? We’ll be working on protecting many more farms over the coming years, thanks to the generous support of Ram Island Conservation Fund and our members. I’m excited to visit these farms and get to know each new landowner. Visiting these farms is a daily reminder of the impact of MFT’s land protection efforts as well as our farm viability and farm access work.